•Follow us on facebook and Instagram for updates, reports, pictures and special deals on our Milwaukee charter fishing or other guided fishing trips. Welcome to All Anglers Guide Service! We are committed to providing you with the ultimate sport fishing experience. Our goal is to provide thrilling action through the effort of our Captain and crew to both catch fish and provide a fun and relaxed atmosphere for our valued guests. We accommodate anglers of all skill levels and specialize in teaching and instruction if desired by our guests. At All Anglers Guide Service, we pride ourselves on performing as a multi species fishing guide service offering the opportunity to catch salmon, trout, walleye, bass, pike and panfish. We provide Milwaukee charter fishing services at competitive prices, allowing our guests to experience the joys of fishing without breaking the bank. 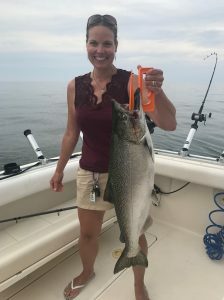 We offer world class salmon and trout fishing on our Lake Michigan fishing charters from the Port of Milwaukee where you will be given the chance to catch Chinook Salmon, Coho Salmon, Rainbow Trout, Brown Trout and Lake Trout. Our Milwaukee charter fishing adventures take place aboard our 30 foot Tiara Open Yacht that is complete with all the latest and greatest electronics and gear needed to effectively target these species. The Tiara Yacht is built to perform in all fishing conditions and will deliver an offshore fishing adventure in a safe and comfortable environment. Captain Tim and Captain Curt have over 60 years of combined experience fishing the Great Lakes and are USCG Licensed and insured Captains. We also offer guided fishing trips to various SE Wisconsin inland lakes and rivers where we will target walleye, pike, bass and panfish aboard our 18ft Alumacraft which is also outfitted with all of the most up to date electronics and gear to assist us in our fishing adventure. 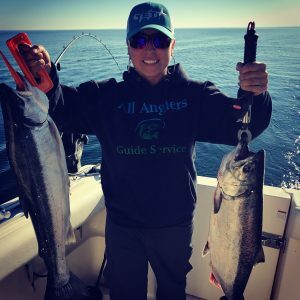 No matter what type of fishing experience you are looking for, whether it be one of our Lake Michigan fishing charters or a guided fishing trip on one of the many inland lakes or rivers, we at All Anglers Guide Service look forward to providing it. We welcome the opportunity to help create experiences and memories that can last a lifetime!